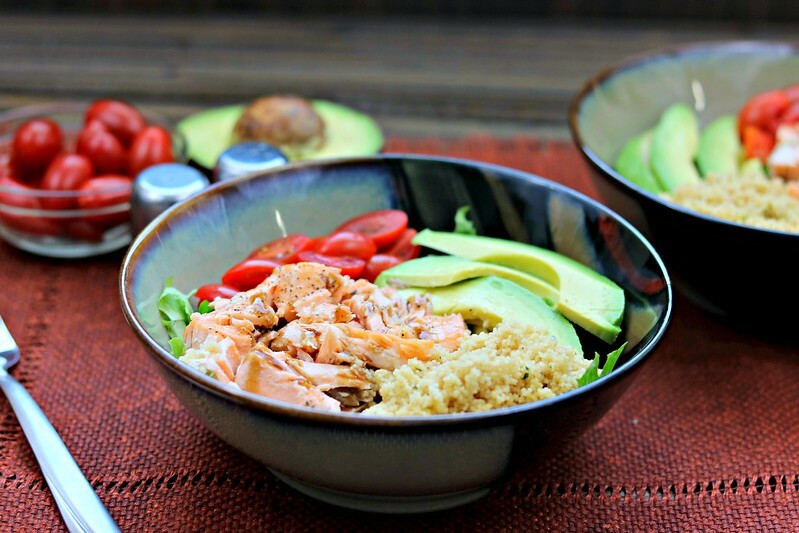 This simple, delicious, and healthy salmon and couscous salad is perfect if you are working on that summer bod, or just enjoy a great entree salad! I guess I am unofficially declaring this the week of throwback recipes. This is one I first posted back in January 2014 and it was way overdue for an updated picture. During the colder months Sundays are typically reserved for casseroles, but as the weather heats up I move away from oven use just a bit, and decided that entree salads would be a great replacement for those casseroles over the next few months of warmer (i.e. hot, hot, hot) weather. When I was menu planning a few weeks ago and I started browsing back through old posts, I saw this one and remembered how much J and I both loved it, and added to the menu. 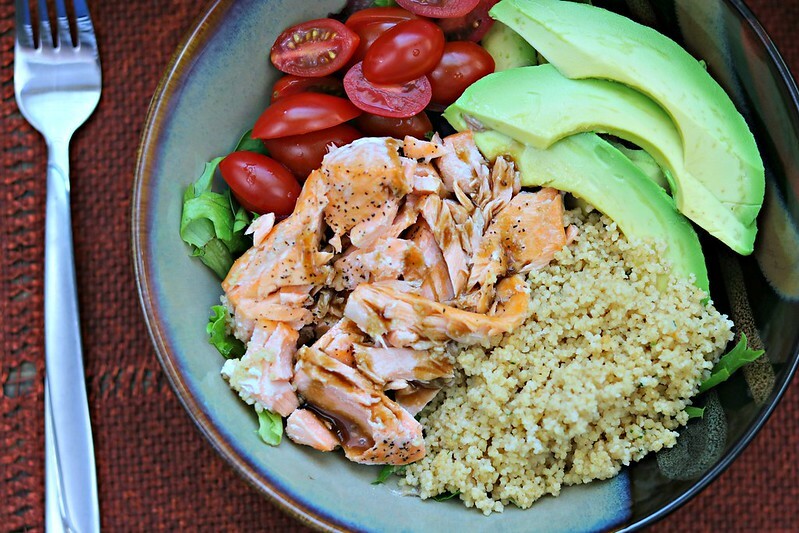 Not only is it healthy and delicious, but it’s super simple and quick to make. Like, less than 20 minutes start-to-finish, quick. If that isn’t the perfect warm weather meal, then I don’t know what is! 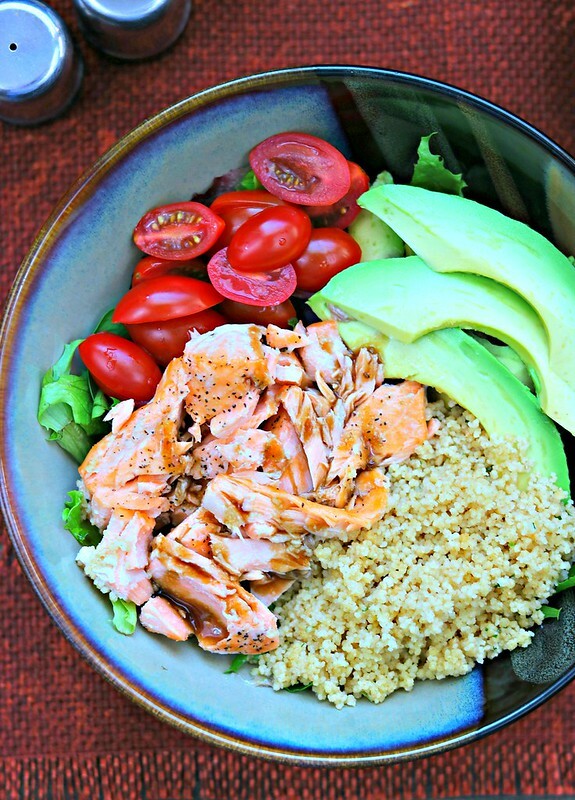 The salmon can be cooked in the oven if you like, or on the stove. And leftover salmon works great, as well, and then it’s ready even faster. In fact, the first time I made this, it was a result of leftover salmon and couscous that I had and needed to use up. I just threw a salad together, that wound up being a favorite of ours. Sometimes it’s the simplest of things that make us the most happy – wouldn’t you agree? Maybe if I eat enough salads, it will offset all the margaritas that I’m bound to have? Maybe?? We’ll just got with that theory. It’s all about balance, amiright? Balance and taste, of course. And this, my friends, tastes amazing. And, just for grins and because I showed you all the comparison in Monday’s Chicken Croquette post…here is the 2014 vs 2018 pics! Meanwhile, cook couscous with chicken or vegetable broth according to package instructions, usually 10-15 minutes. 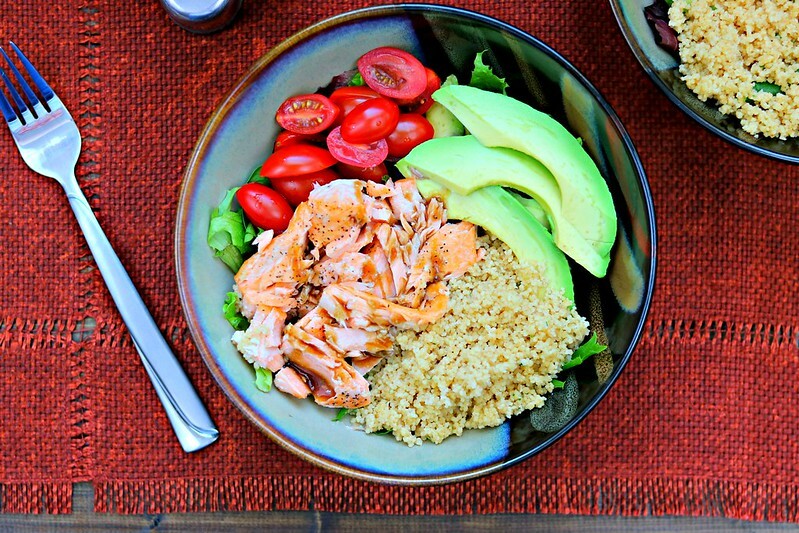 To assemble the salad, place a handful of spinach or salad mix in each bowl and top with a spoonful of couscous, half a salmon fillet, 1/4 of an avocado, a spoonful of tomatoes, and top with dressing. 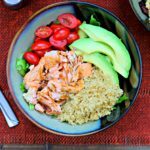 *Alternately you can place salmon, skin-side down in a skillet over medium-high heat and cook for 4-5 minutes per side (removing skin with tongs once you flip), until cooked through. This method works just as well and keeps you from having to turn on the oven! 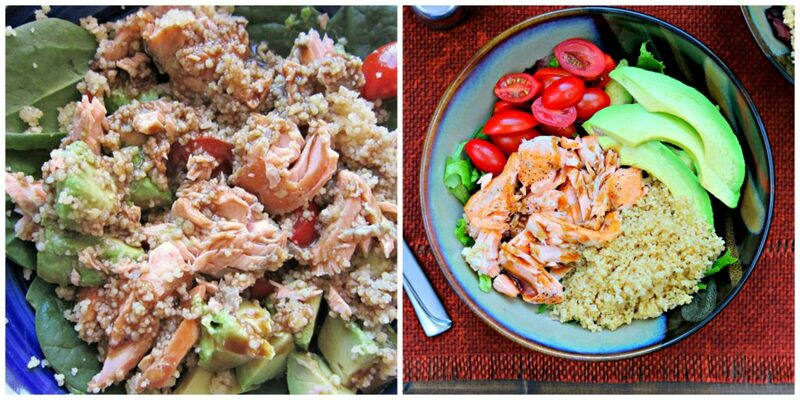 I love cous cous in a salad, but I have never tried to make it myself at home- thanks for a great recipe!